Speedometer is an app by Sygic that not only gives you speed information but also does a couple of other things. With a simple looking interface the app is designed mainly to give you speed trap information along your route. This includes red light cameras, police traps and even traffic incidents. I briefly tried this app yesterday and this is how it works. This app is available on iOS, Android, and Windows for free. None of the versions are AppRadio compatible but the app is a good tool for driving safe. The interface is simple and easy to read. On launching the app you see the dashboard screen which shows a numerical speedometer with your speed using your smartphone's GPS. The speedometer is accurate for the most part but there were a few discrepancies at some points during my ride. The difference in speed shown in the app versus my car's speedometer was only 2 or 3 MPH at most though. Trap warnings are shown on the dashboard too. These were most often red light cameras in my case. You can report police presence or traffic incidents from the dashboard itself using the large corresponding buttons. 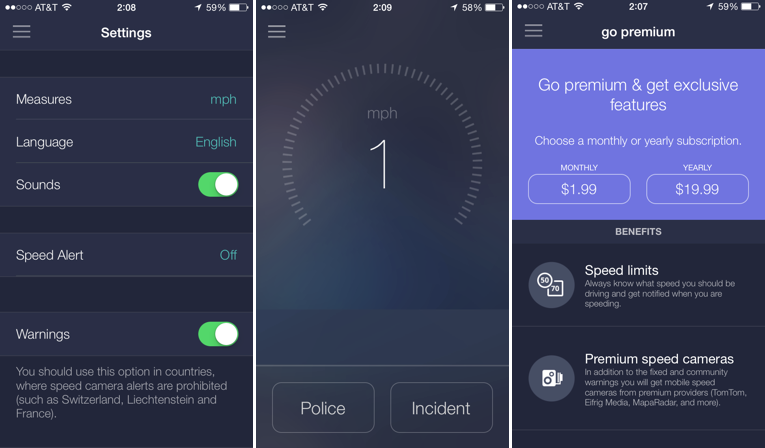 Most of the features of Speedometer are based on crowd-sourced data, much like what Trapster does. Since the former is a newer app, there isn't much user data to go by. As a result some of the other features of the app aren't as robust yet. You can view a list of nearby warnings from the List menu in the app. In my case, I got a list of red light cameras around me. Additional features of Speedometer include trip logging. The app will save your trip data whenever it's in use. This could be useful for folks interested in trip logging for business purposes, for example. However, there is no way of exporting trip data which limits its usability. In the Settings menu you can toggle between metric and imperial units of speed, change language (10 available), turn app sounds on/off, set a speed alert and toggle warnings on/off. The app advises users to use the Warnings options in countries where speed camera alerts are prohibited (such as Switzerland, Liechtenstein, and France). Setting a speed alert can help you keep a check on your speed. The app warns you with a sound when you exceed your set speed limit. Premium features are available for a fee of $1.99 per month or $19.99 a year. By going premium you will get speed limit information for most roads and streets and premium speed camera information from providers like TomTom, Eifrig Media, and MapaRadar. If you already use Trapster you should stick to it as Speedometer's lack of user data currently doesn't warrant a switch. If you want to help make the app better though, you should start using it and reporting traffic and speed trap data, thereby adding to what the app needs - crowd-sourced driving data. As more users start using Speedometer it will continue improving.